Club Penguin Cheats by Mimo777 Club Penguin Cheats by Mimo777: Club Penguin Christmas Party Coming! Woot! 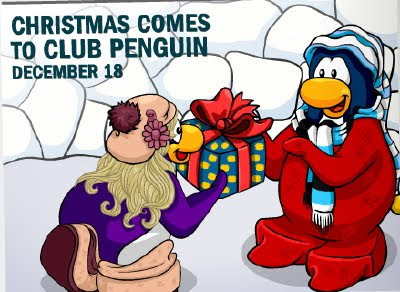 The Club Penguin Christmas Party will be here on Dec. 18th. I hope there are lots-o-lights and presents this year! Rockhopper will be here next week and he has promised to bring something really special. Since Club Penguin has already said we would be able to donate to Coins For Change in our igloo, do you think Rockhopper will be bringing one of these? That would be sweet, except probably only members would be able to buy it. Hmm, I wonder what his free item will be this year. Let me know your ideas, k? Im so excited, I love Coins For Change and I am a member. I will buy the Coins For Change item for my igloo's for both my penguins. I want to raise as much money as I can! I think the free item might be a hat, top or shoes. Waddle On! Yea I hope Rockhopper brings PIE as his new free item!!!! A background probably. Mimo, you still haven't put up my idea. The one about the yeti cave and herberts tracks? Plz add and say thenks to Jitsu Jedi ok??? Mimo, Lil Here and i found a cool update! Check out the dance off game, when you play multiplayer mode theres a grid so you can see whos going to be playing with you in the game. Cooool Huh?? Mimo i think that will be the item that Rockhopper brings us! Mimo how do i earn other gems for my amulet.i have the fire one but i dont know how to win others. Awesome first coins for chenge yay yay yay!!! I would like to tell you this very special news of mine. Pleas would you tell people about my special news. I am going on Britains Got Talent on Friday 11th December. If you would make an annoucment about it that would be very kind. Awesome! Happy early penguin Birthday :D My cousins penguin (that's a member, and I use it since he quit CP) is 1010 days old today! This is awesome! Merry Christmas! Mimo you should do a club penguin age competition? i think its gonna be the lighthouse shirt. cool! on club penguin's membership page, it says that there'll be a special sleigh adventure for members on this year's christmas party! Does Santa give us anything on cp? I HOPE SOMEONE PLAYS MY PENGUIN. what!!! im only onethousand and fifty something! Congrats! Glad you are enjoying Club Penguin! You probably mean 500 because for it to be 5000 cp would have to have been around for about 14 years. That wouldn't be fair to other penguins because it doesn't take any skills, minds, or commen sense to win that contest. Uh...There is no santa that I know of but if you mean rockhopper, he gives you a gift that you can get when you see him. or if you go to his ship and click on the items. I'm gonna spend over 100,000 coins each. THATS RIGHT BEFORE MY BIRTHDAY! this i thjink it will be a lighthouse striped t-shirt! Anonymous Im not sure if santa going to give us gift but let watie and see! i hope he will and also have a good time! oh my gosh december 18th is my birthday! !